We are one world. When a massive, earthquake-spawned tsunami slams into a nuclear power plant on the coast of Japan and melts down three reactors, as it did six years ago, it impacts the whole planet. The Fukushima Daiichi Nuclear Power Station disaster in March 2011 resulted in 100,000 gallons of radioactive water spilling from the northeast coast of Japan into the Pacific Ocean – on that horrific day and every single day since then, day after day after day. For six years and counting, the deadly water has continued to flow from Fukushima into the ocean current, and the extremely high radiation levels detected in the air there have only risen over this time, into the Earth’s atmosphere. To make the plight even worse, Japan’s Prime Minister, Shinzo Abe, has entirely ignored it, never mentioning Fukushima and in fact continuing to promote nuclear energy. Meanwhile, the Japanese government has yet to adopt a plan to extract the crumpled old nuclear reactor rods from the wreckage. 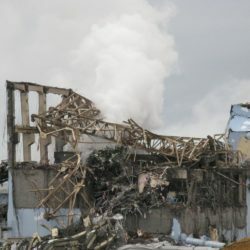 Around the globe, the silence around Fukushima has been deafening, with no government taking the lead, or even taking up the conversation, about how in the world we can resolve the Fukushima problem. At the World Business Academy, we have a weapon to fight the silence; we have Akio Matsumura. In 2005, long before the Fukushima disaster, the Academy board voted to create the Akio Matsumura Chair in International Diplomacy. The Chair helps to fund the ongoing efforts of Matsumura, a world-renowned environmental diplomat who had retired from his life’s work at the highest levels of the United Nations, where he helped create major global conferences on nuclear arms reduction. In his retirement, Matsumura watched with the rest of us as Fukushima unfolded. As a young child, he had lived in Japan when atomic bombs were dropped on Hiroshima and Nagasaki. Until Fukushima, he thought the only thing “nuclear” that he needed to fear was nuclear war. In March 2011, his energy shifted. We are deeply grateful to Akio Matsumura for his ongoing commitment to the Academy’s fight against nuclear power. With his unique history and expertise, he is resolved to bringing together members of the international community to right this wrong, for the good of our world. To read more about Matsumura, his esteemed career and his work with us at the Academy, and to contribute to his current efforts here, please visit his page. To better understand the gravity of the nuclear situation, we urge you to read our white paper on nuclear power and climate change. Widely considered to be the definitive published statement on the topic, the comprehensive document has never been refuted.